How did 420 get started? “420” has become a ubiquitous term for everything cannabis related. Groups of cannabis connoisseurs religiously meet at 4:20 PM (and AM) to medicate, and it has become a beacon for cannabis enthusiasm across the globe. April 20th is just around the corner, with many cannabis enthusiasts preparing to pay homage to this beautiful, healing plant. It’s a day where the cannabis community bands together to celebrate our holiday. How many of you know the history behind “420”? Do you know where and how it started? While there are highly contentious and conflicting stories, the most reliable sources date the first use of the term “420” back to 1971 in Marin County, California. A small group of San Rafael High School students that called themselves the “Waldos” heard about a rumored abandoned cannabis grow in the Marin County area. On a mission to find the mythic grow, the group of friends would meet by a school statue at 4:20 PM. They would smoke, then venture off to try to find the lost gem. Several weeks went by, but the rumored grow was never found. After a number of meetings at 4:20 PM, the “Waldos” began referring to 420 as everything and anything cannabis related. Whether it was used to ask if someone had any cannabis on them, or if someone looked stoned, 420 became the term for discretely (at the time) identifying cannabis. One of the Waldo’s older brother knew Grateful Dead bassist Phil Lesh, and it is said that the band helped popularize the term “420” bringing it to their large fan base. High Times Magazine first mentioned the term as early as 1990, but it is believed that the term became popular across the globe within a decade of its spread to the Deadheads. As we know it today, “420” plays a huge part in the cannabis culture. Whether it’s that special day in April, or when the clock finally changes from 4:19 PM to 4:20 PM, it means something much more than just a set of numbers to the cannabis community. In a way, the term 420 unites our community, and gives us a sense of identity and purpose. We all stand united in the fight for legalization, and each “4/20” we get closer towards safe access for all. The Apothecarium wants to wish everyone a happy and enjoyable 4/20, make sure to medicate safely. 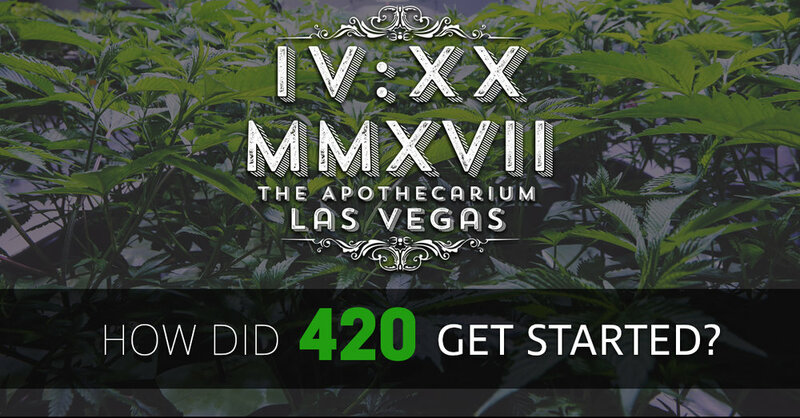 If there is anything that we can help you with please reach out to the Apothecarium at info@Apothecariumlv.com.